Invite Bluebird Ice Creamery for a truly awesome event in the L.A. area. 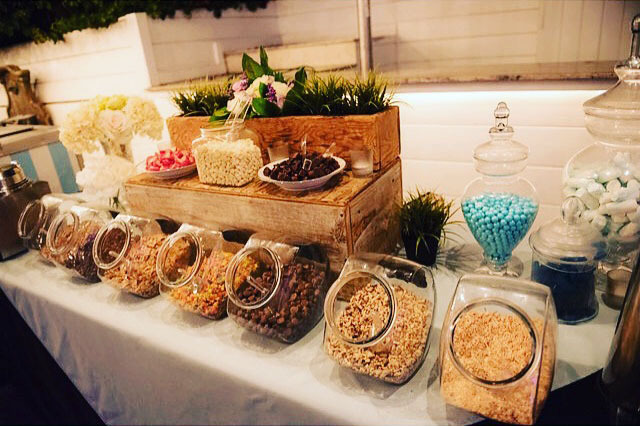 When you invite Bluebird to your event, your guests will enjoy handcrafted artisan ice cream in awesome flavor choices, a jaw-dropping array of premium toppings, and delightful detail-oriented service. They'll never know how easy it was for you. Our costs are clear and concise - nothing hidden...no surprises. For larger events where service is essential let us bring our fabulous sundae extravaganza to your event, along with our happy server, cart and umbrella. Our most popular option! *Note: For minimum guest counts events of 50 persons - Bluebird will bring an assortment of our most popular ice cream flavors and toppings. You’ll love our selection! Let us deliver sundae happiness right to your door (L.A. area only). For smaller events where a server isn't necessary or desired....everything you need for a fabulous dessert bar. Custom Cup Labels - 36 piece minimum!